A play by Arthur Miller, performed at the Apollo Theatre, London: 19 May - 2 October (extended from 11 September) 2010. 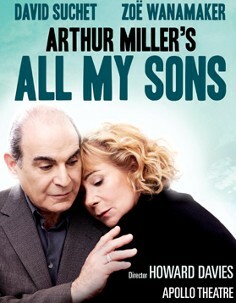 All My Sons is set shortly after the Second World War, in a well-to-do American neighbourhood. During the conflict, Joe Keller's manufacturing firm allegedly supplied US military aircraft with defective engine parts. When the planes' engines failed, twenty-one pilots were killed - a crime for which Joe's business partner is serving a long prison sentence. Joe also stood trial, but was acquitted. Now the controversy is almost forgotten, and the manufacturer seems to have regained the trust of his relatives and neighbours. Neither Joe nor his troubled wife, Kate, can forget that their son, Larry, himself a pilot, is thought to have been killed in action. More than three years after he was reported missing, Kate clings to the hope that the young man will return. How will she react to the news that Larry's former fiancee and daughter of Joe's business partner, Ann Deever, now loves her other son, Chris? The ensuing confrontations expose long-buried secrets. Whereas Joe believes that he safeguarded his family's interests during wartime, the repercussions of his actions threaten to tear the Kellers apart. The trailer publicising this production highlights some of the tensions that surface during the course of the play. The full production was filmed and is available to download or watch online, via Digital Theatre. While rehearsing All My Sons, Zoë commented on the play's tremendous tension and suspense: 'It starts quietly, and then just builds' (see 'Zoë Wanamaker is put through the Miller' interview). Performances were no less intense: at the time, she commented that finding an object sufficiently depressing to help put her in Kate Keller's frame of mind was proving impossible (see 'Stuck in the Misery Zone' article). The emotive power of her performance was widely acclaimed, and All My Sons became one of the most successful productions in which Zoë has starred to date. In the light of its popularity, the performance schedule was extended by almost a month. At the opening night performance, she was pictured by Whatsonstage.com and Daniel Wooller, alongside her colleagues and audience members. Howard Davies is among the directors Zoe works with most frequently; in addition to All My Sons, he has directed her in a number of other successful stage productions: Piaf (1978, UK production), Piaf (1981, US production), The Time of Your Life (1983), Mother Courage and Her Children (1984), The Crucible (1990), and Battle Royal (1999). In 2011, they will present The Cherry Orchard at London's National Theatre. Zoë is also a longstanding friend and colleague of her All My Sons co-star, David Suchet. Before playing the Kellers in this production, they acted together in The Taming of the Shrew (1978), Once in a Lifetime (1979, stage production), Once in a Lifetime (1988, TV production), and several of TV's Agatha Christie's Poirot mysteries, in which Zoe has a recurring role as Ariadne Oliver, the crimewriter foil to Suchet's Belgian detective. When interviewed with Zoë on the Andrew Marr Show, David Suchet explained that the fact they have worked together many times and are comfortable in each other's company helped them to develop 'a wonderful shortcut' to the extreme emotional responses required by All My Sons. They feel 'totally, 100% safe' when acting together, despite the demands of their roles in Arthur Miller's play. To prove his point, the interview includes a clip of a particularly tense scene from the production. During the same interview, Zoë discussed her family's connection to the author of All My Sons, Arthur Miller. As she explained, her father, the actor and director Sam Wanamaker, worked with him on several productions; she then met the playwright when appearing in a revival of another of his works, The Crucible (1990). She has also appeared in Miller's The Last Yankee (1993). The month after All My Sons ended, Zoë and her husband, the actor and writer Gawn Grainger, were photographed arriving at the 2010 Evening Standard Theatre Awards. During the ceremony, Howard Davies was named Best Director, following the production's success. Zoe was among the guests briefly interviewed at the awards ceremony (the video is about half-way down the webpage; Zoe's comments begin after about five-and-a-half minutes). She remarked that All My Sons's cast 'all had a very good time' and worked very well together - an observation borne out by the fantastic reviews the actors received. For her portrayal of Kate Keller, Zoe was nominated for Best Leading Actress in a Play in the BroadwayWorld UK Awards. She then won Best Actress in a Play in the Whatsonstage.com Awards. 'This is a stunning production of a modern classic', declared Charles Spencer in the Telegraph, adding that Zoë is 'outstanding' as the deeply troubled Kate Keller. The Guardian's Michael Billington agreed: 'she emits cries of despair which wrench the soul'. Zoë's portrayal of the grieving mother is 'spine-chilling, the very music of pure grief', commented James Richards in PinkPaper. He added that the whole cast is 'scintillating and totally unmissable'. All My Sons is 'wondrously and woundingly well acted', observed Mark Shenton in the Express. 'As the Kellers, David Suchet and Zoë Wanamaker are astonishing', enthused Nina Caplan in Time Out. It is their 'superlative work that makes director Howard Davies' production an absolute must-see', agreed David Finkle, writing for TheaterMania.com. The Independent's Kate Bassett was similarly impressed by the stars' 'beautifully naturalistic' acting. The British Theatre Guide's Philip Fisher also praised the 'exceptional, potentially award-winning performances' given by Zoe and her co-star. 'Wanamaker is an incredible presence on stage', emphasised the Londonist. 'Each time one sees Zoe Wanamaker on stage she gains an extra dimension', echoed The Stage's John Thaxter. Among the many other positive reviews of this production: Jarlath O'Connell for The American, Gareth King in Ceasefire Magazine, Lizzie Loveridge for Curtain Up, Henry Hitchings in the Evening Standard, Sarah Hemming in the Financial Times, Ray Bennett for The Hollywood Reporter, John Nathan in the Jewish Chronicle and also for Theater News Online, Edward Lukes in The London Magazine, Peter Brown for the London Theatre Guide, Susannah Clapp in the Observer, The Official London Theatre Guide, Christopher Gray in the Oxford Times, Jennifer Lipman for Running in Heels, Minette Marrin for Standpoint, and Michael Coveney for Whatsonstage.com. In addition, 17-year-old theatregoer Pandora Haydon, was highly commended in the Guardian's Young Arts Critics Competition 2010 for her review of All My Sons. It praises Zoë's 'continuously poignant' performance. With thanks to Bethan and Nadine for bringing the Evening Standard Awards video to my attention.